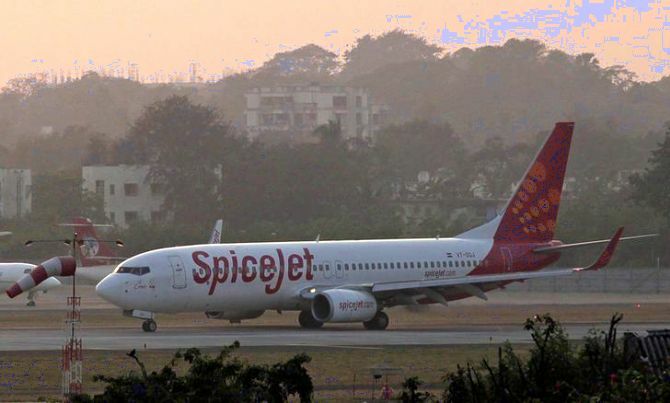 The market, however, reacted negatively to SpiceJet’s announcement and the company’s stock dropped by 0.87 per cent as analysts became wary of diversion into a new business during a high fuel price environment. Ajay Singh-owned SpiceJet on Monday took a big bet on the booming e-commerce market of India and dived into the air freighter business. The airline, which will have a separate division for the freighter business under the brand name SpiceXpress is betting on the increasing popularity of next-day delivery services that e-commerce players like Flipkart and Amazon are offering to customers. “E-commerce is a big driver behind our foray into the freighter business. "With next day delivery services of Amazon, Flipkart delivering high-value goods and equipments, there is a need for a freighter airline, which can offer time-specific services,” Ajay Singh, CMD, SpiceJet said while announcing that freighter will start operations between Delhi and Bengaluru - India’s e-commerce hub. Airports in the first phase also include Guwahati, Amritsar, Kabul and Hong Kong. SpiceJet said it would ship perishables like farm fresh fruits and vegetables to the international destinations. Singh outlines an aggressive expansion plan to almost double the cargo capacity of the airline by inducting 13 aircraft by 2019, which will be a mix of the 737-700 and 737-800 variant. “The current cargo capacity of the airline is about 500 tonnes per day and with the induction of the freighters it would go up to 900 tonnes per day by March 2019,” he said while posing in front of the first Boeing-737-700 freighter of the airline, which has been converted from an all-passenger to a freighter. Through its freighter conversion programme, US aircraft manufacturer Boeing transitions passenger airplanes into freighters. The seats of the plane are removed creating space for cargo. Modifications also include installing a large main-deck cargo door, a cargo-handling system and accommodations for up to four crews. SpiceJet is up against an entrenched Blue Dart, which has a virtual monopoly in the air cargo service with a market share of 49 per cent. Blue Dart, which operates with six Boeing 757 has a daily capacity of 500 tons and is most importantly backed by a robust ground support that includes 11,122 vehicles and 610 retail outlets. Singh’s new venture would also face competition from the passenger airlines as they frantically induct new aircraft providing more belly space and thus eating into the business of dedicated freighter carriers. “Additional cargo space and express capacity availability is posing a challenge to maintain yields, for instance, the available belly space in passenger aircraft and their express service focus. "The aviation sector is witnessing an aggressive momentum to acquire new aircraft, which will further add to the capacity availability,” Blue Dart mentioned in its annual report. The airline was able to fill only 70 per cent of the freighters in the first six months of 2018. Analysts though said that Singh’s foray is a calculated bet in boosting ancillary revenue for the core business as passenger yield doesn’t show any sign of improvement. “The difference between yields of carrying 180 passengers versus 80 live animals is massive. "If you had asked me 10 years back of a separate freighter business I would have said no, but now there definitely is a business case,” said Mark Martin, CEO of aviation consultancy firm Martin Consultancy adding that SpiceJet will unleash a price war to take on the incumbents. “This will ultimately benefit the common man and the decreased cost of logistics will drive down the cost of the item,” he said. Singh, however, said that there has been no major capital investment in the project. “The freighters will be acquired on pure operating leases and haven’t incurred any major capital expenditure. The ground operations will either be self-handled by existing pool of workforce or will be outsourced,” he said.